Protect your carrot, parsnip, celery and parsley crops from carrot-fly (which do not fly at greater altitudes than the height of the screen) whilst simultaneously protecting them from wind damage, flea beetles, rabbits and cats. 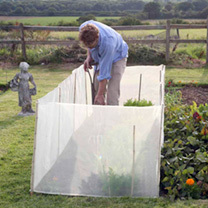 The Micromesh fabric is the finest gauge mesh available (0.6mm), and is used by millions of gardeners worldwide. Each pack contains two sheets of fabric, each measuring 4m (13') long x 90cm (3') high and including 5 integral 90cm (3') bamboo canes.